Drum roll .... we've picked a name... Kate Corinne Murphy! Well, I guess it's already been announced on the blog but no one knows the story behind the name game and how it came to be! Kyle and I spent weeks talking about names and had lots of names we loved for girls! We actually refused to talk about boy names until we found out for sure whether a boy was in order. We couldn't agree on any names for boys, so thankfully, we didn't have to endure that challenge. Our top three girl names were Kate, Claire and Olivia (probably in that order), but for some reason, we both kept coming back to the name "Kate" and loved it so much! The middle name Corinne is a family name -- it's actually in both of our families and so we knew we wanted to use the name Corinne as a middle name. Corinne is my late great grandmother's name and it's also Kyle's late great grandmother's name. I remember my great grandmother so well and have some of the fondest memories of her. She was so full of life and fun to be around even as she grew older. I can only hope Kate will have as much love for life as my great grandmother. We also tossed around the idea of spelling Kate with a "C" but couldn't fall in love with that idea. 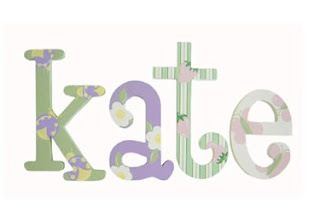 We wanted to keep it true to the classic spelling and we steered away from Katherine or something a little more formal because we love the shorter version, Kate. So, that's the story behind the name...not too exciting but wanted to share!